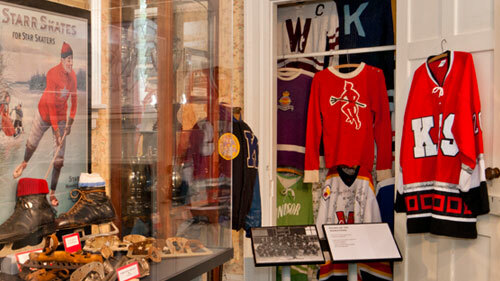 Hockey Fans of all ages continue the trek each year to view Windsor’s Hockey Heritage Museum. Viewed with awe and delight fans will discover artifacts and collectibles from more than a century ago during the earliest days of the sport. Most hockey enthusiasts consider Windsor, the Birthplace of Hockey® as a ‘must visit’ location to see the game’s evolution as it developed from ice hurley in the early 1800s to the professional sport of ice hockey as we know it today. The exhibit is displayed over two floors within the Haliburton House Museum and showcases new items and old favourites each year. The Attic space at the museum displays hockey memorabilia and the Locker Room displays hockey jerseys and equipment from the past. The museum's kitchen uses the concept of the “hot stove” to celebrate local hockey heroes. The exhibit also features the Starr Trophy and highlights the diversity in hockey, featuring the contributions of women, First Nations and African Nova Scotians in the sport. Visitors may choose to take a guided tour or to browse the collection at leisure. The sport’s treasured collection of artifacts, newspaper articles, trophies, equipment, individual player and team memorabilia awaits your arrival. The Windsor Hockey Heritage Museum is operated by the Windsor Hockey Heritage Society - a not-for-profit organization dedicated to the preservation of hockey heritage and the celebration of Windsor, Nova Scotia, as the birthplace of the game of ice hockey.